Wara l-kollass tal-pont f’Ġenova hemm numru ta’ lezzjonijiet, anke għalina, mijiet ta’ kilometri ‘l bogħod mill-pont Morandi. Minkejja li l-investigazzjonijiet uffiċjali dwar l-għaliex seħħ dan il-kollass tal-pont għadhom bil-kemm bdew, il-media Taljana diġá qed tiddiskuti dak li ġara fid-dettall. Il-pontijiet kollha fl-Italja qegħdin taħt il-lenti, b’mod partikolari dawk li hu magħruf li m’humiex f’kundizzjoni tajba u li allura jistgħu, f’qasir żmien jikkollassaw huma ukoll. Dan jassumi sinifikat ikbar meta wieħed iqis li f’dawn l-aħħar ħames snin, fl-Italja, diġa ikkollassaw seba’ pontijiet oħra, u qiesu ma ġara xejn! Bla dubju, fost il-lezzjonijiet ewlenin, jeħtieġ nifhmu l-ħtieġa li nieħdu ħsieb u nikkuraw b’mod adegwat il-proġetti pubbliċi. Għax anke f’Malta, wara li l-proġetti pubbliċi jkunu saru, ħafna drabi ftit nagħtu kas tagħhom. Ħarsa ftit lejn il-flyover li tifforma parti mill-bypass tal-Marsa/Ħal-Qormi kif inhi illum, tkun biżżejjed, avolja kif ħabbret Infrastruttura Malta nhar il-Ġimgħa ma hemm l-ebda ħsara strutturali. Huwa biss issa li tħabbar li ser jibda programm ta’ manutenzjoni, issa li n-nies, wara l-istraġi ta’ Ġenova, bdiet tistaqsi l-mistoqsijiet. Forsi, min jaf, mil-lum il-quddiem jibda jkollna skeda regolari ta’ manutenzjoni tal-proġetti pubbliċi kollha. Forsi xi darba l-mini ta’ Santa Venera ma jibqgħux iqattru. Deċiżjoni riċenti tal-bord li jirrevedi l-kuntratti pubblici (Public Contracts Review Board) hi ta’ tħassib kbir. L-għoti tal-kuntratt għall-bini u t-tkomplija taċ-Ċentru tas-Saħħa f’Raħal Ġdid ġie mwaqqaf wara li Public Contracts Review Board esprima dubji serji fuq kif tmexxew il-proċeduri tal-evalwazzjoni tal-offerti. Fil-fatt ġie identifikat li żewġ professjonisti (inġinier u Perit) kienu konsulenti kemm tal-Fondazzjoni tas-Servizzi Mediċi tal-Ministeru tas-Saħħa kif ukoll ta’ tnejn minn dawk li tefgħu l-offerti. Fil-fehma tiegħi huwa diffiċli ferm biex nifhem kif ħadd mill-Fondazzjoni għas-Servizzi Mediċi ma nduna b’dan il-konflitt ta’ interess. Kont nistenna xi ħaġa aħjar mill-Fondazzjoni, għax jidher li ftit li xejn qed jagħtu importanza lill-ħtieġa ta’ governanza tajba fil-ħidma tal-fondazzjoni. Issa li l-Public Contracts Review Board ħa deċiżjoni nistenna li l-korpi professjonali li jirregolaw l-inginiera u l-periti jeżaminaw sewwa l-kaz biex jaraw x’passi għandhom jieħdu f’dak li hu ksur ta’ etika professjonali bażika. Il-kontroll adegwat tal-materjali li jintużaw fuq is-sit ta’ kostruzzjoni hi materja oħra ta’ importanza fundamentali. Din mill-ewwel tfakkarni fl-investigazzjoni li saret dwar il-kwalitá tal-konkos użat fl-isptar Mater Dei. Anke hawn kienet responsabbli l-Fondazzjoni għas-Servizzi Mediċi. Dwar dan ma kienx hemm biss l-inkjesta li saret taħt it-tmexxija tal-Imħallef irtirat Philip Sciberras imma ukoll rapport tal-Awditur Ġenerali fuq talba tal-Ministru tal-Finanzi. Dan ir-rapport kien konkluż u ippubblikat f’Mejju li għadda. Niftakru li l-Awditur Ġenerali fir-rapport tiegħu kien emfasizza li rriżultalu li kien hemm nuqqas kbir ta’ dokumentazzjoni dwar kull stadju tal-proġett (significant lack of documentation with respect to all stages of the project). Dan wassal lill-istess Awditur Ġenerali biex jikkonkludi li “l-inkapaċita tal-Fondazzjoni li tipprovdi l-informazzjoni bażika dwar proġett ta’ dan il-kobor ifisser falliment istituzzjonali u negliġenza grassa fl-amministrazzjoni ta’ fondi pubbliċi” (the Foundation’s inability to provide basic information relating to a project of this magnitude represents an institutional failure and gross negligence in the administration of public funds). Min-naħa l-oħra, anke l-inkjesta immexxija mill-Imħallef irtirat Philip Sciberras identifikat nuqqasijiet kbar li dwarhom irrakkomandat li jittieħdu passi. Ma tantx jidher li sar wisq dwar dawn ir-rakkomandazzjonijiet. X’qed nistennew? Li jaqa’ x’imkien? Hemm tagħlim waħda bażika minn Ġenova: in-nuqqas ta’ governanza tajba tista’ twassal ukoll għall-imwiet. Among the many lessons to be learnt is the need to ensure adequate maintenance of public structures at all times. How does Malta score? Not very well, I would say. Have a look at the bridge forming part of the Marsa/Qormi flyover. It does not send out a good message even if, as stated by Infrastructure Malta on Friday, the flyover is structurally safe. The authorities in Malta have only announced the commencement of a maintenance programme for this bridge when questions began being asked as a result of the Genova tragedy. Hopefully we will henceforth have regular maintenance schedules of all public structures and, maybe, someday the dripping Santa Venera tunnels will be seen to permanently! What about good governance in tenders for public projects? A recent decision by the Public Contracts Review Board is cause for concern. The award of the contract for the building and finishing of a health centre in Paola was halted by this Board after serious doubts regarding the evaluation procedure were raised. In fact, two professionals (an engineer and an architect) were identified as being simultaneously advisors of the Health Ministry’s Foundation for Medical Services as well as two of the three tenderers. It is, in my opinion, very difficult to understand how nobody at the Foundation for Medical Services was aware of this glaring conflict of interest. Good governance is apparently not the Foundation’s strong point. Adequate quality control of materials used on site is another fundamental issue. The investigations regarding the quality of concrete used in the construction of the Mater Dei Hospital project comes to mind. The Foundation for Medical Services was also responsible for this project. This issue has been dealt with not only by an inquiry led by retired judge Philip Sciberras but also by a report drawn up by the Auditor General at the request of the Finance Minister, which was concluded and published last May. On the other hand, the inquiry led by retired judge Philip Sciberras also identified various deficiencies in respect of which it recommended that action be taken. Apparently, not much has been done to date regarding the implementation of the recommendations of these reports. Shall we wait for our own bridge collapse before action? Wara l-istraġi ta’ Genova bla dubju it-Taljani ser jippruvaw jitgħallmu l-lezzjonijiet li s’issa ma rnexxielhomx jitgħallmu, sforz amminstrazzjoni ġeneralment inkompetenti u korruzzjoni fl-għoti tal-kuntratti. 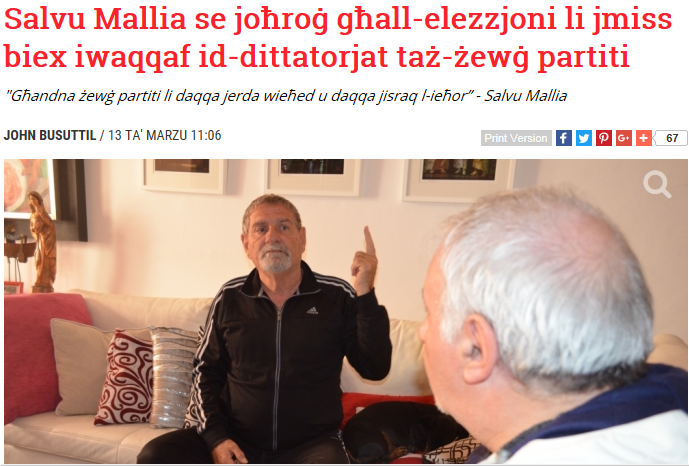 L-investigazzjoni dwar x’wassal għall-kollass tal-pont għadha fil-bidu. Il-pont ilu hemm iktar minn 50 sena u bla dubju kemm saret (jew kemm ma saritx) maintenance adegwata tul is-snin ser tkun materja fundamentali fl-investigazzjoni. Anke l-fatt li l-pont kien ilu daqstant snin, hu fattur, għax probabbilment messhom ilhom li ittieħdu passi biex il-pont jinbidel għax il-konkos tiegħu bla dubju għejja u per konsegwenza ddgħajjef wara dan is-snin kollu fl-użu. F’dan il-kuntest ikun tajjeb li flok il-konkos ta’ Genova niftakru ftit fil-konkos ta’ Mater Dei. Dwar dan hemm mhux biss ir-rapport tal-awditur ġenerali, ppubblikat f’Mejju li għadda, imma ukoll ir-rapport tal-inkjesta immexxija mill-Imħallef irtirat Philip Sciberras. Ikun tajjeb li niftakru li fir-rapport tal-Awditur Ġenerali kien ġie emfasizzat li kien hemm nuqqas ta’ dokumentazzjoni li hi tant essenzjali biex tingħata l-assigurazzjoni li proġett ta’ dan il-kobor sar sewwa. Min-naħa l-oħra r-rapport tal-inkjesta immexxija minn Philip Sciberras kien identifika diversi nuqqasijiet li dwarhom irrakkomanda li jittieħdu passi. Wara l-istraġi ta’ Genova għandna kull dritt nistaqsu: x’passi ittieħdu dwar ir-rapporti fuq il-konkos ta’ Mater Dei? Għax jekk ma jittieħdux il-passi neċessarji, dawn l-affarijiet ser jibqgħu jirrepetu ruħhom. The National Audit Office (NAO) has recently published its report for 2017. In a democracy, the role of the NAO is of paramount importance. Its role of ascertaining the presence (or absence) of good governance at all levels is crucial in determining the health of the public sector. The report lists the investigations carried out during 2017 in respect of which separate reports have been published and discussed publicly. These include the annual report on the public accounts, the consolidated annual report on local government, special audits and investigations and performance audits. Last year also saw the publication of a stand-alone report on the results achieved by the three main revenue-generating departments of the government, namely the Inland Revenue Department, the Value Added Tax Department and the Department of Customs. In his overview, Auditor General Charles Deguara welcomes the positive developments, highlighting the administration’s commitment to implementing the NAO’s recommendations as far as possible. This has been done for two consecutive years and it is to be hoped that it becomes an annual occurrence. The report explains the efforts made to continuously train the staff, thereby ensuring that, as far as possible, an internal team of experts is available to monitor and investigate as required. This is essential in order that the NAO keeps the administration on its toes. The NAO, in its present format, was set up 20 years ago. Since 1997, it has been part of Parliament, accountable directly to Parliament. Previously, although technically independent it formed part of the Ministry of Finance. During the past 20 years, it has had much to do. Its specific investigations are the ones about which we hear the most but the workings of the NAO go much deeper. Its continuous examination of the country’s public accounts, and the recommendations made to fine tune or correct methods of operation are always work in progress. In order for the NAO to be as effective as possible, it should ensure that it keeps at arm’s length from the administration’s day to day operations. For this reason I was worried when reading in the 2017 report a short list of a number of domestic working groups in which the NAO participated. These range from the International Public Sector Accounting Standards (IPSAS) Implementation Project Board, the Financial Legislation Working Group, the Local Government Good Governance Working Group and others. The NAO should have oversight and not sit around the same table forming part of working groups to implement or draft a proposal for implementation. Some years back the Auditor-General, together with the Ombudsman and the Chairman of the Electoral Commission, had decided to go beyond their terms of remit and accepted the Prime Minister’s invitation to examine the issue of the salaries of MPs and holders of political office. I had taken the Ombudsman Said Pullicino to task about his stand when, together with Arnold Cassola I had met the trio. They then justified their stand by referring to legal advice from the Attorney General’s office and others! The three wise men did not realise that they had compromised their office because they cannot – and should not – switch from being regulators to being advisors, even if temporarily. The NAO would do well to take a step back, thereby ensuring that it is at arm’s length from the administration. Otherwise it risks sending the wrong messages. Darba waħda, Evarist Bartolo kien qalilna li r-Rumani kienu jgħidu li hemm liġi għall-allat u oħra għall-annimali. Ma kienx hemm għalfejn immorru lura sar Rumani biex insiru nafu dan, għax il-ġrajja ta’ dawn l-aħħar ġranet dwar il-pensjonijiet tpinġi b’mod ċar li anke lil hinn mir-Repubblika ta’ Ruma, ftit l-isfel, fir-Repubblika ta’ Malta għandna pensjonijiet għall-allat, pensjonijiet bla limitu, kif ukoll pensjonijiet għall-annimali, għall-bqija. L-istorja tas-Sunday Times tal-bieraħ hi gravi, imma fiha żball. Philip Sciberras kien Membru Parlamentari f’żewġ leġislaturi. Tela’ l-ewwel darba f’byelection fl-1979 meta kien irreżenja l-Ministru Ġuże Abela, dakinnhar Ministru tal-Finanzi. Reġa’ tela’ fl-elezzjoni ta’ Diċembru 1981. Total li jaqbez il-minimu ta 65 xahar servizz. Alternattiva Demokratika hi preokkupata bl-allegazzjoni gravi ħafna li qed tagħmel is-Sunday Times dwar indħil lit-Teżor fl-ipproċessar tal-applikazzjoni għall-pensjoni parlamentari ta’ Philip Sciberras. Jekk dan hu minnu, dan ikompli jżid l-isfiduċja enormi li bħalissa hawn f’dawk li jeżerċitaw il-poter politiku. Min-naħa l-oħra jekk din l-allegazzjoni hi biss qlajja huwa meħtieġ li jkunu ċċarati l-fatti malajr kemm jista’ jkun. 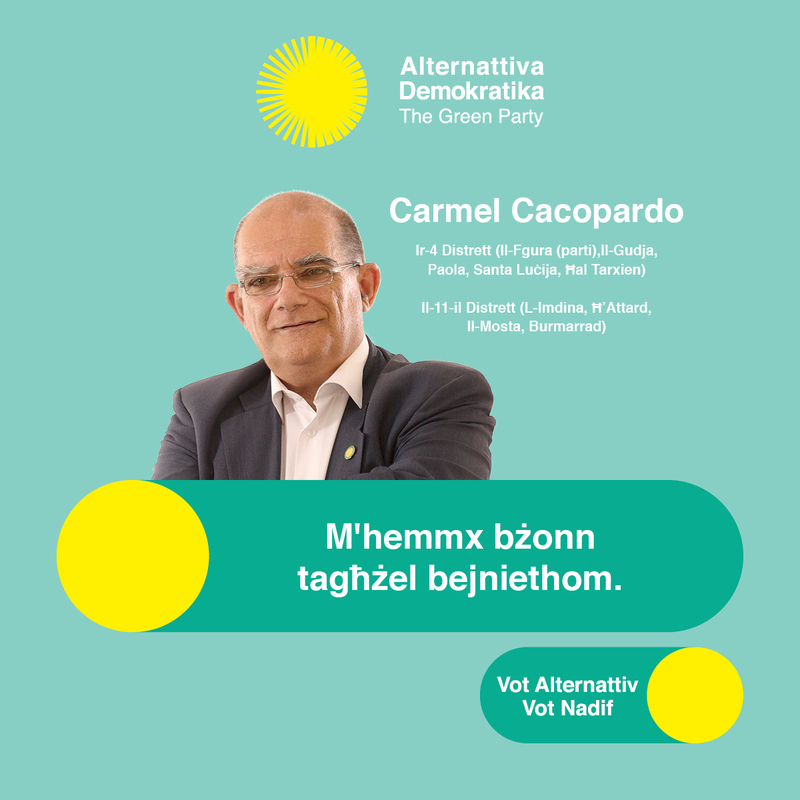 Għax mhux sew li jintefa’ l-ħmieġ lejn ħadd. Qegħdin fl-istat li kull ċaħda li tista’ issir mill-Gvern, ħadd ma hu ser jemmina u dan bħala riżultat tal-iskandli wieħed wara l-ieħor li qed ifaqqsu madwarna u qiesu ma ġara xejn. F’dawn iċ-ċirkustanzi l-Awditur Ġenerali biss għandu l-kredibilitá u l-awtoritá morali li jitkellem. Għall-kelma tiegħu f’każ bħal dan inbaxxi rasi. Bħalma bla dubju jagħmlu bosta oħrajn. Għalhekk għada fil-għodu f’isem Alternattiva Demokratika ser nitlob lill-Awditur Ġenerali biex jinvestiga bir-reqqa ċ-ċirkustanzi li fihom ġiet approvata l-pensjoni ta’ Philip Sciberras. Mhux biss jekk kienx intitolat għaliha, imma fuq kollox jekk saritx pressjoni fuq it-Teżor biex din il-pensjoni tingħata. Titħassru lil Jason, l-Onorevoli, li qed jħossu intimidat minn ġurnalisti li qed jiġru warajh għal spjegazzjonijiet dwar dak li ġara fid-Dipartimenti li għalihom kien responsabbli bħala Ministru matul l-2012 u l-2013. Bi tlett rapporti tal-Awditur Ġenerali li jikkritikaw l-operat ta’ dak li kien il-Ministeru tiegħu, Jason l-Onorevoli għad għandu ħafna xi jwieġeb. S’issa ħarab milli jwieġeb. Jeħtieġ li jwieġeb dwar in-nuqqas ta’ tmexxija tajba da parti tiegħu (good governance), li dwarha, l-Onorevoli jipprietka ħafna, imma mill-bqija, kif ngħidu, brodu. Għall-Kap tal-Opposizzjoni din ukoll hi siegħa tal-prova. Għax kif jippretendi li jitwemmen li jrid imexxi Gvern serju, jekk l-anqas mill-Opposizzjoni ma hu kapaċi jassigura li l-Membri Parlamentari tal-partit tiegħu jagħtu kont ta’ egħmilhom?